i met up with 3/4 of my princesses for dim sum date! but the rest of the 'dishes' were fine! 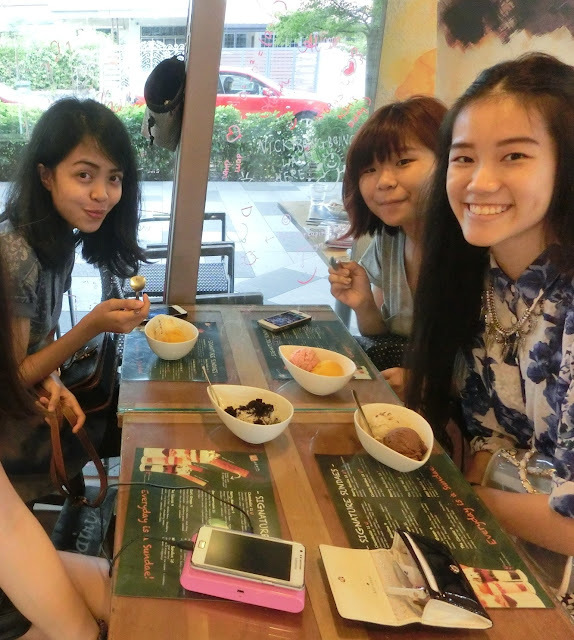 & we didn't even saw any sign stating that..
we head down to Serangoon Garden's Udders! my boy came to join us! check out Jiayu's work of art! After that, I left for dinner with my family at BreadTalk building's Din Tai Fung! this sour-spicy soup made me soooo sad! & accidentally pour too much inside. & have too pour away the rest that became horrible cos of my recklessness!! ohyeah! this is my all time favourite! everytime i come to DTF, i will always order this! we ordered another plate cos i wanted more! this time we order one with pork slices! My dad was teaching us (mainly my bro) about yingyang!! bro & my mango pudding! is one of my favourite chinese restaurant! overall, i really enjoy all the company & food of cos! I"ve received so many request about how i achieve such a long ponytail with my middle length hair! So here is my video on how i tie my hair up into a 'long' ponytail!